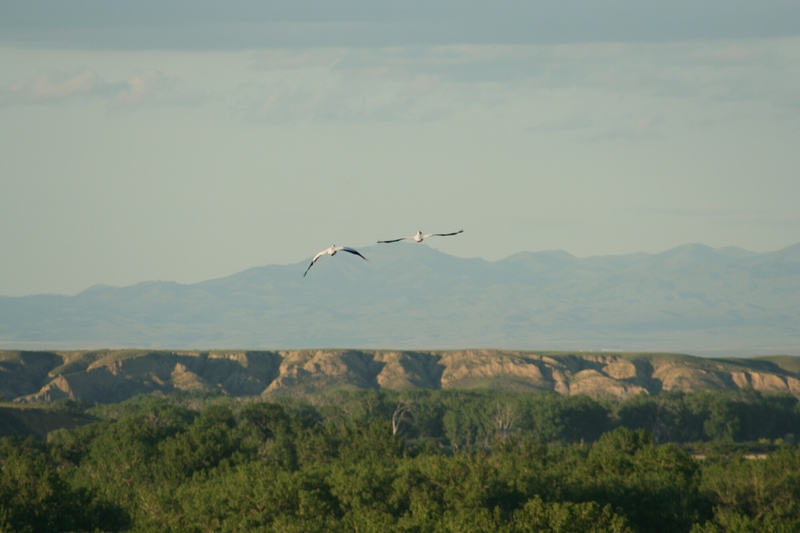 Pics taken at confluence of Missouri and Yellowstone rivers. Zeusy wants this bone. Update! 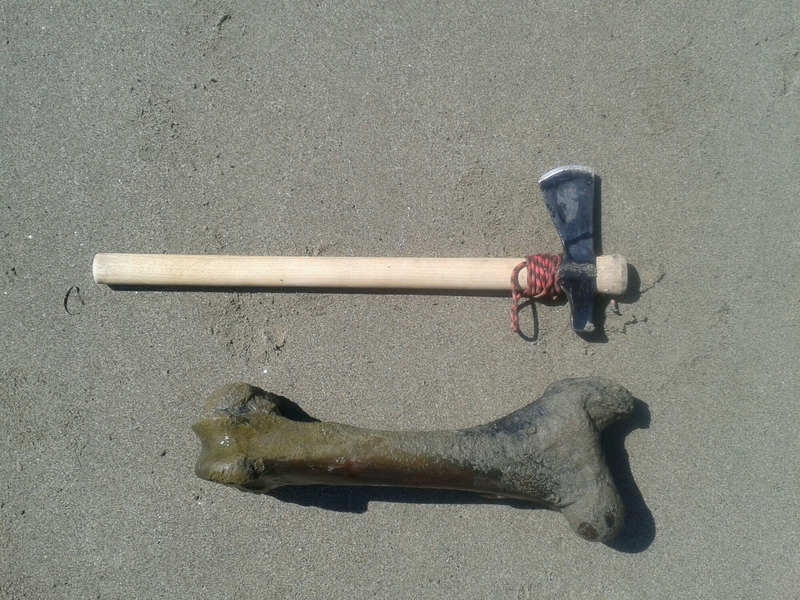 I believe the mystery to what this bone belonged to has been solved. I found it in three feet of water in the Missouri river just North of the Knife river in North Dakota. 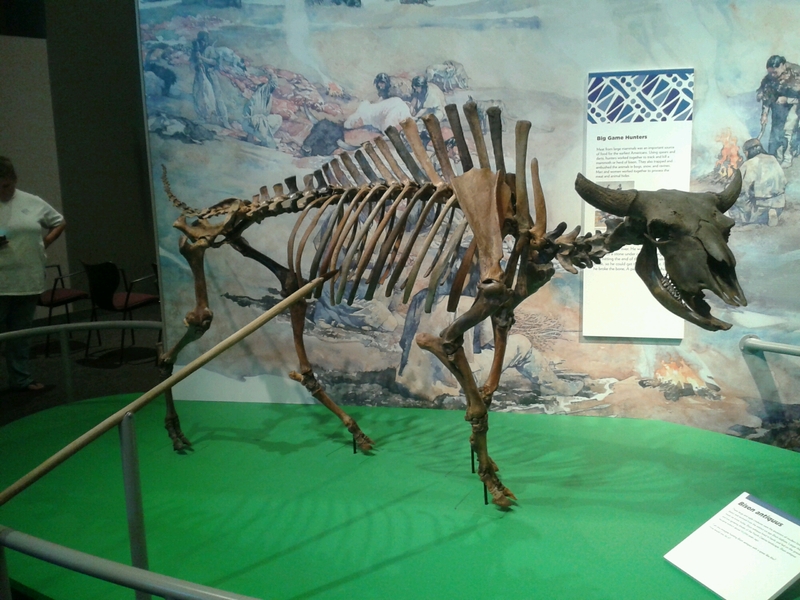 At recent trip to the North Dakota Heritage Center I found they had a skeleton of a Bison. 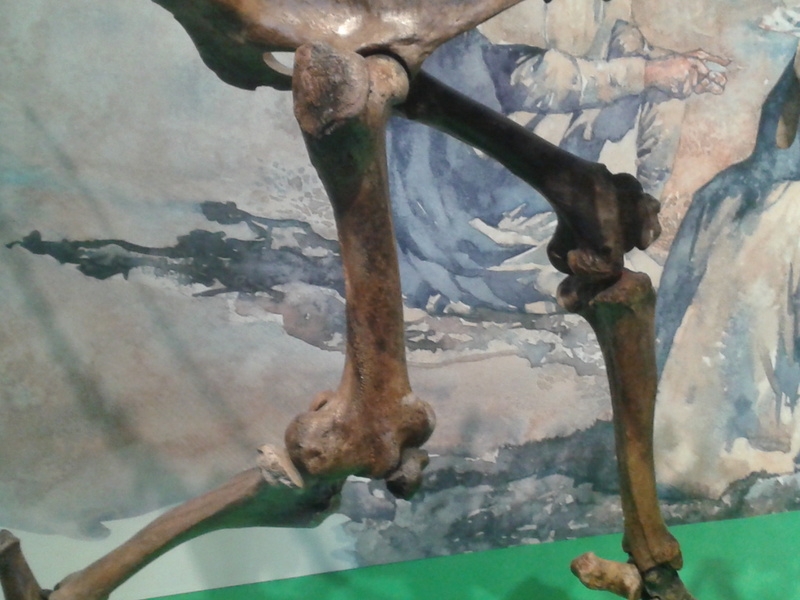 Upon examination I believe the femur bone to be very similiar to the bone I found. 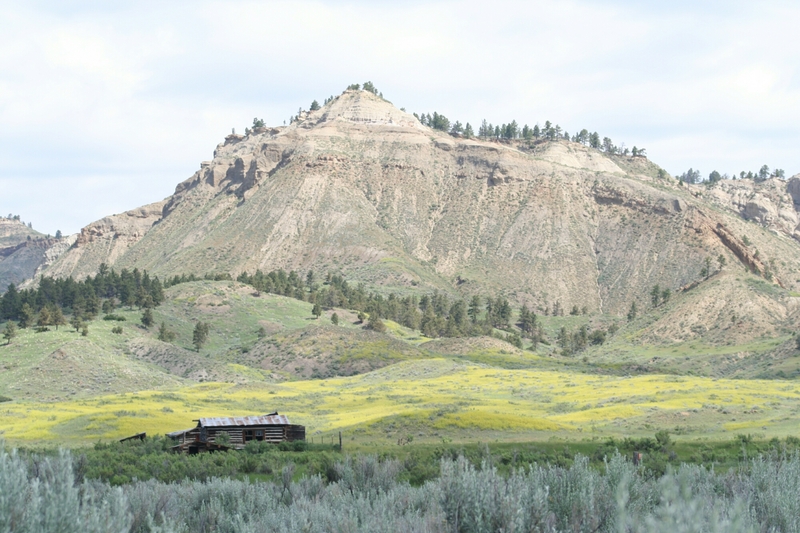 Wild Bison have not been in the Dakotas since the 1800’s and there are places where Bison had been stampeded off of cliffs by Native Bison hunters many years ago. The Bison had been hunted by both Native Americans and Whites into the 19th century being a source of food and clothing among other things. While waiting at the James Kipp Rec. Area which is the end of the Upper Mo. river breaks, and into the Charles M. Russell Nationional Wildlife Refuge I had the most amazing campsite mates anyone can imagine. Marshall is from St. Coix, Wisconsin, and spends his summers with his dad a resident of Montana. What a great opportunity for them and for a few days for me as well. Now Marshall is a first class kinda guy that has a big heart for dogs and others. Now if you talk to Marshall be ready to talk hunting, fishing, and dogs. 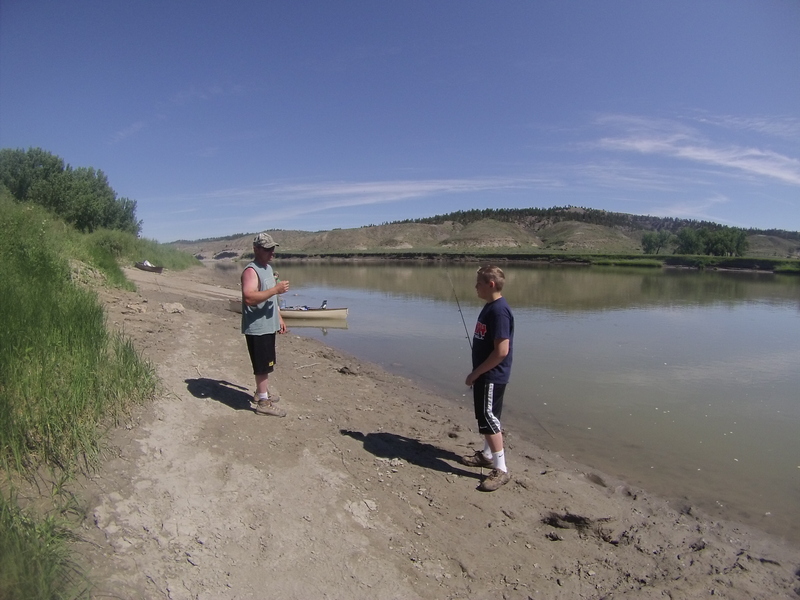 He taught me everything I need to know about fishing that section of the river. Types of fish, and how to catch them. He also talked a lot about his four pawed pals Trigger and Bruto. His dad is first rate as well, an experienced outdoors man and awesome father who spends a lot of his time with his boys. It shows in his son, a happy 13 year old who is glad to be in Montana with his dad. Now Marshall would catch the fish, and his father would cook it with potatoes, carrots, and onions as well. They invited a waiting river traveler to dinner every night. It was an amazing meal ! I hitched a ride with them to Roy, Mt. To the Roy’s Market. While there Marshall made sure Zeusy would get a brand new rawhide bone. When we returned to camp Zeusy got spoiled with the new rawhide and ate it until one end knot was left. The day Nathan and Marshall left Zeusy got a little down. It was obvious that he missed them. Why wouldn’t he ! 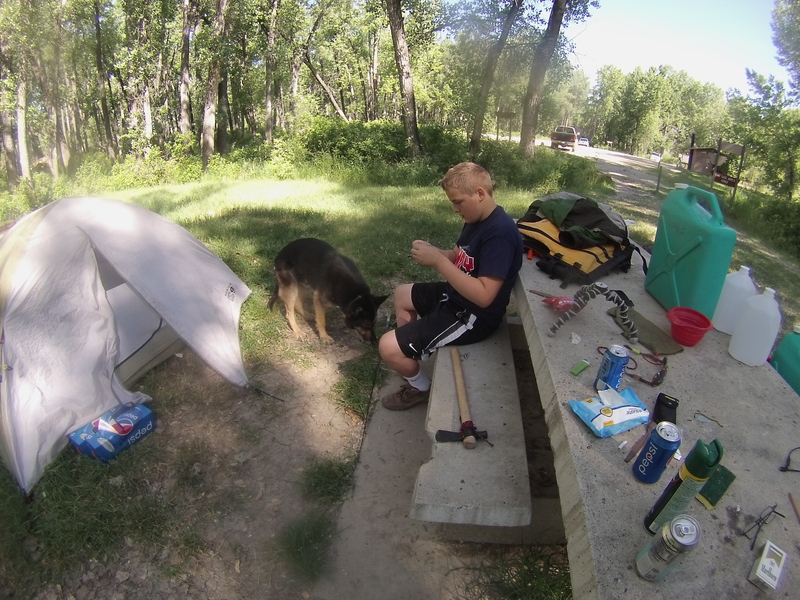 Marshall would throw a stick for monster dawg in the river, at camp, and he always got a ton of attention. That night Zeusy and I went to bed and he went into the tent and I followed. When I laid my head down I noticed that he fell asleep with the knot of the rawhide bone. He carries it around now not chewing on it. I think he has happy thoughts about a first class kid who treated him like he was one of his own. Thank you both gentlemen ! Your freindship I will always brag about having ! PS I dont have the means to download pics from the camera, but when I do I will add the Dixie chopper boat right here.